The concept of a food chain originated with Al-Jahiz, a ninth-century Arabic author of some two hundred books on a wide range of subjects including grammar, poetry, and zoology. In his zoology work, he discussed a struggle for existence among animals who hunt to obtain food and who are, in turn, hunted. Charles Elton, an Oxford faculty member, was among the most important animal ecologists of the twentieth century. In his classic 1927 text Animal Ecology, Elton laid out the basic principles of modern ecology, including, rather explicitly, food chains and food webs, which are now central themes in ecology. At its simplest level, a food cycle follows a linear relationship from the base of the food chain—a species that eats no other (typically, a plant)—to the final predator or ultimate consumer, which is typically three to six feeding levels in length. Elton recognized that this simple food chain depiction was a gross oversimplification of “who eats whom.” The food chain failed to account for real ecosystems, in which there are multiple predators and multiple preys, and the reality that a given animal might consume other animals if the preferred prey was not available. Moreover, some carnivores also eat plant material and are omnivores; conversely, herbivores occasionally eat meat. The food web, a concept now preferred to food chain, represents these highly complex interrelationships. In 1942, Raymond Lindeman postulated that the number of levels in a food chain is limited by trophic dynamics, or the effective transfer of energy from one part of the ecosystem to another. After food is consumed, energy is stored in the body of the consumer, and it travels in only one direction. Much of that energy is lost as heat (when the food is being utilized for basic needs), and the remainder eliminated as waste material. In general, only about 10 percent of the energy consumed is available at the next higher trophic (feeding) level. Thus, with each successive level up the chain, less energy is transmitted and, therefore, food chains rarely exceed four to five feeding levels. SEE ALSO: Agriculture (c. 10,000 BCE), Population Growth and Food Supply (1798), Population Ecology (1925), Energy Balance (1960), Deepwater Horizon (BP) Oil Spill (2010). 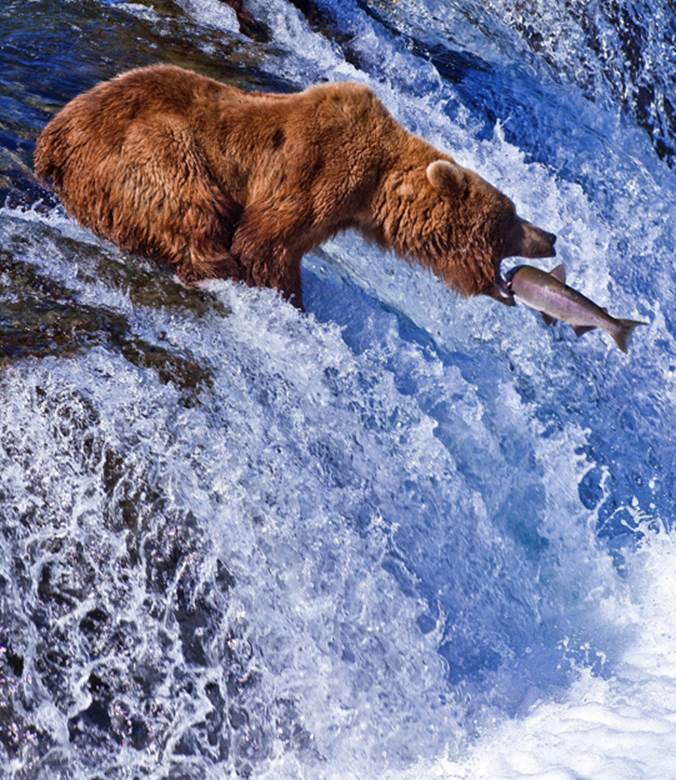 The food web is exemplified at Katmai National Park, Alaska, where this grizzly bear is a jawful away from eating a fish, which fed on a smaller fish or microscopic plants or animals floating in the water.